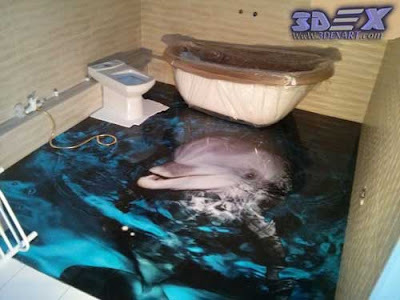 3D Dolphin flooring photo printing "dolphins" is ideal for interior design and decor, 3d dolphin mural more suitable for the bathroom, children's room, living room, kitchen, and hallway too. 3DEX ART presents you a huge number of designs for "3D Dolphins flooring", and also to develop individual designs of 3d epoxy flooring with dolphin murals and photo printing on the floor especially for you, with the subsequent embodiment of it in life. Since ancient times, dolphins have caused people's feelings of rapture and reverence. They were considered mystical and mysterious, they were worshiped, they were loved and deified. 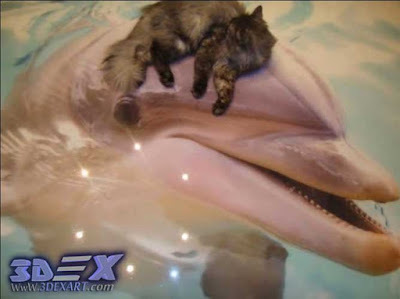 Centuries have passed, and the dolphin is still considered one of the most mysterious animals of the world. We are fascinated by the intellect and grace of the dolphin, its beauty, and physical abilities. 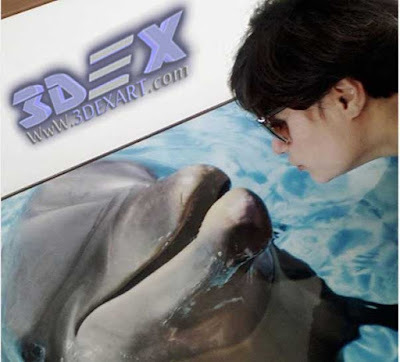 Dolphin symbolizes the boundless sea, nobility and freedom, pleasure and love, speed and safety. That is why the 3d dolphin flooring photo printing enjoys such a huge popularity in interior decorations. 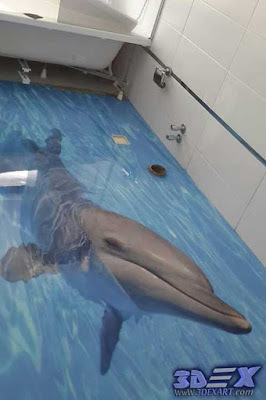 Did not resist the divine beauty of the dolphins and our visitors, who had the pleasure of personally watching these beautiful animals in their own element. This spectacle impressed me so much that it decided to capture in its interior the most memorable moment - a synchronized jump of a dolphin pack over the expanses of the boundless sea. 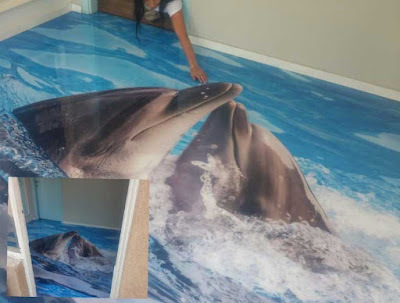 Now the 3d Dolphin painting on the floor will constantly remind him of those wonderful moments when he plowed the sea and involuntarily witnessed a beautiful picture. 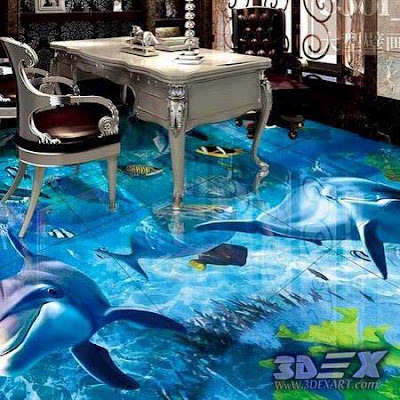 In addition, 3d dolphins flooring mural will fill his soul with joy and pacification, because it is difficult to look at them, and not be imbued with their beauty, nobility, and grace. 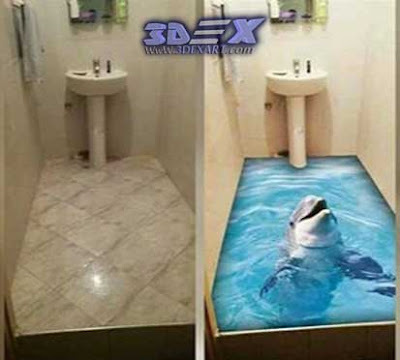 Don't miss to see: How to get 3D bathroom floors in detail? 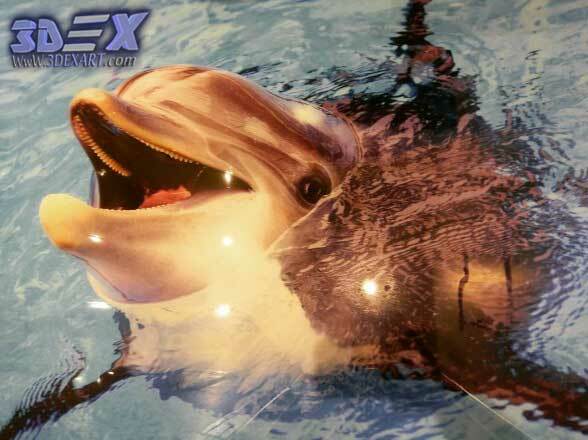 Not just draw chaotic dolphins, and come up with a highlight that will be interesting primarily to children. So there was an idea to make a submarine ship, ie, draw on the flooring portholes in which the dolphins view. 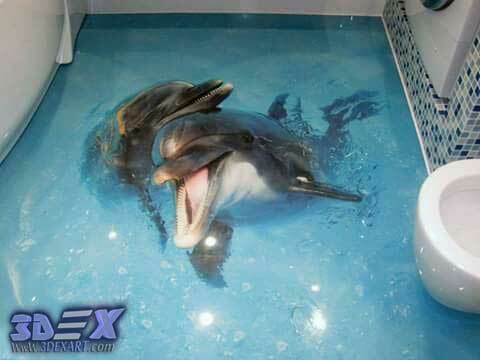 Flocks of dolphins, who masterly swim in the ocean. 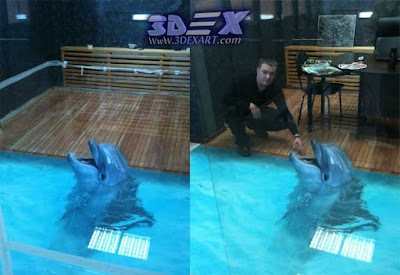 It is especially beautiful to observe how several dolphins do this at the same time. This is a kind of dance that can bewitch with its beautiful performance. 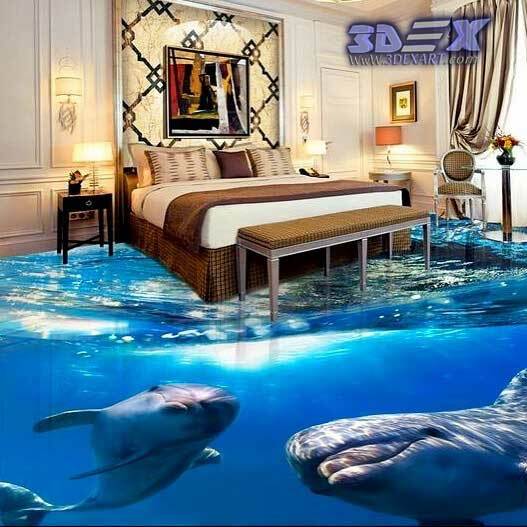 The portholes on the bedroom flooring "3d dolphin flooring" are distinguished from the general 3d photo printing on the floor by their brightness (saturation). 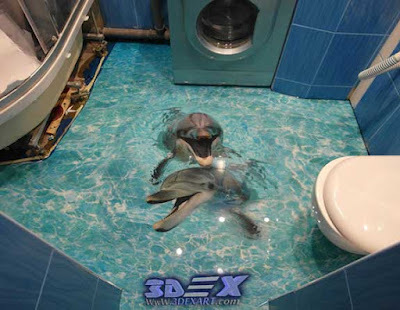 Dolphins are amazing, kind, incredibly intelligent creatures. 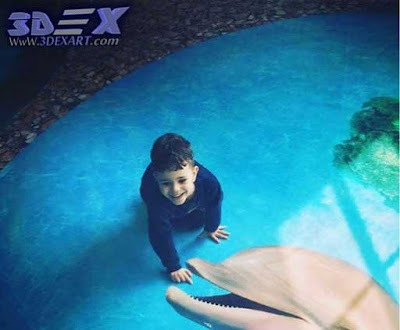 The symbolism of the dolphin is friendship, support, generosity, responsiveness, therefore it is a good addition to the children's room (in the interior of the kid's room ). 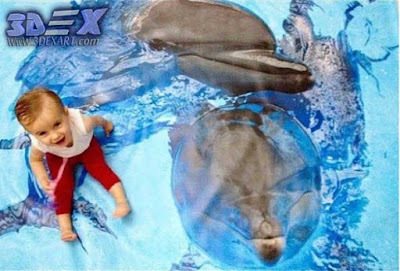 Dolphins delight almost all adults and children. 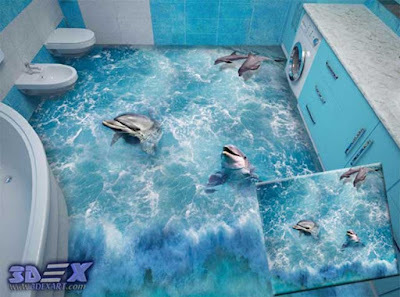 Analyzing all of the above, it was decided to draw in the interior of the kid's bedroom is the 3d dolphins painting or mural. 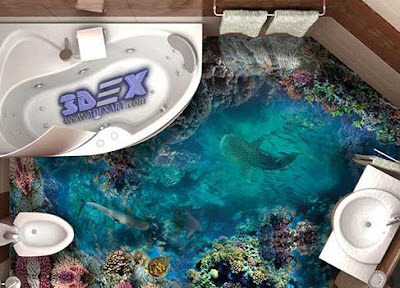 This series represents a marine theme in the design of children's furniture. Children's room with 3d Dolphin flooring will appeal to both girls and boys from 3 years. 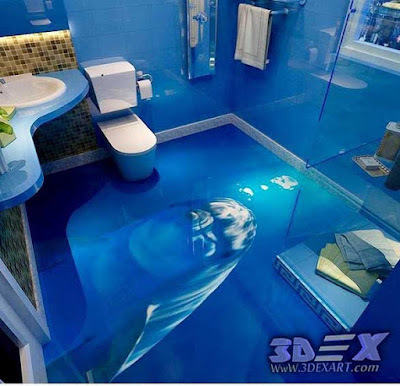 A children's room decorated in a romantic sea theme will be your child's best gift for years to come. 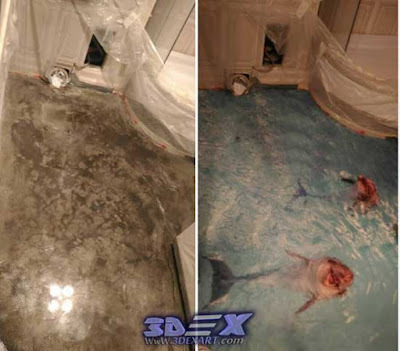 I think that 3d Dolphin flooring mural turned out very realistically on the floor. 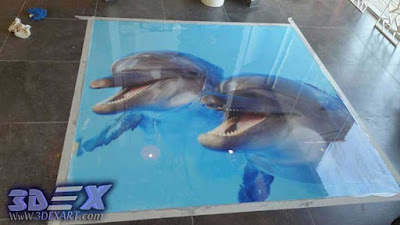 3d Painting on the floor "A pair of dolphins" by numbers with materials exp " 3d Epoxy paints + brush + instructions + some materials will appear like the work of art and appeal to both children and adults. 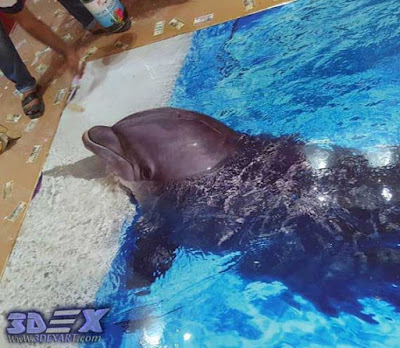 A 3d Epoxy Flooring with 3d dolphin photo printing exp: many shades, shadows, and colors will look like it's from a museum.